Copyright by Gail Bable, Aug 2002, please ask permission if distributing copies of this pattern to groups. I'm an avid sock knitter and one of my favorite patterns is the "waffle sock". I loved it so much I decided to come up with a "waffle hat" to send to Ship Support. 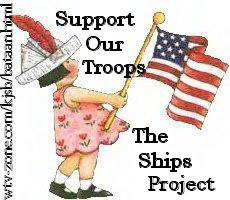 This a charity providing hand knit items to our men and women serving in our armed forces. You can find out more about this charity and Ship Support by clicking on the link below. Skein worsted weight yarn (Ship Support is requesting drab (camo, browns, dark greens, black, etc) colors right now. Size 8 (16") circular needle and set of double points or whatever size you need to get the gauge below. 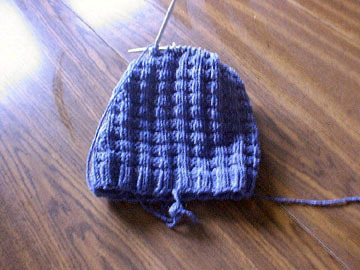 Gauge: 4 stitches to 1", 6 rows to 1"
Cast on 76 stitches. Join being careful not to twist your stitches. Knit 2, Purl 2 around placing marker at the end of the row. Repeat this row for 12 rows. Repeat the pattern row until the hat measures 7", ending with the two knit rows. Repeat rows 11 and 12 until only 8 stitches remain and cut yarn leaving a 10" tail. Using large eyed sewing needle run thread through remaining stitches and fasten off. Weave in ends and finish off. Cast on 64 stitches and follow above knitting instructions until piece measures 6". Follow instructions then to decrease and complete hat. For a new born cast on 48 or 52 stitches and follow instructions until piece measures 5", then follow decrease instructions and finish. For more information on Ship Support Click Here!! 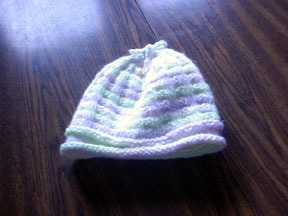 To add a roll brim to your hat, at the beginning instead of the K2 , P2 for 12 rows , Knit 10 rows then purl 2 rows. Following these 12 rows, begin the pattern rows.